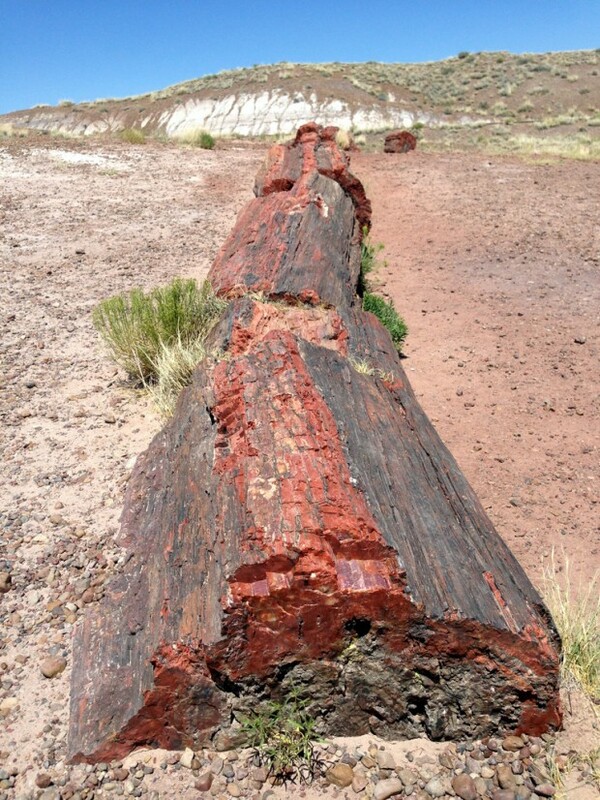 The Petrified Forest is located in Northeastern Arizona in the Four Corners region, and is a high altitude desert landscape containing thousands of tree stumps and logs that have been petrified (trees turned to stone). Entrance to the park is $10 per vehicle. Petrified Forest National Park may be experienced by driving along the 28-mile scenic road and walking on short trails to many fascinating sights and viewpoints. The average elevation in the park is 5,400 feet above sea level, so pace yourself accordingly. High winds are very common, and the temperature can vary wildly during the day. We were recently driving in Northern Arizona (returning to Phoenix from Albuquerque, New Mexico) and we took the detour south from Interstate 40 through the Petrified Forest National Park. This is an absolutely beautiful National Park that is partially within the Painted Desert. Perhaps one of the first things you should know is that this is a park you can visit primarily by vehicle, unless you want to backpack. In fact, it will most likely only take you about one to two hours to tour the entire park by car, assuming you stop at each of the designated scenic views along the main road in the park. However, you should know that most of the park is only accessible by trail. Because there’s really only one road through the park, you can’t get lost. We visited in late June, and with temperatures in the high ’90s we kept our air conditioner going as we made our way through the park. President Theodore Roosevelt recognized and protected this area as a national treasure in 1906, when it became the country’s second National Monument. National Park status was given to this area in 1962, and in 1970 and 50,000 acres within the park were designated as wilderness, the first such designation within the National Park System. If you’re like me, you are curious about the difference between a National Monument, a National Park, a National Forest, and a Wilderness Area. The answer is quite simple: the President of the United States can, at his discretion, declare an area to be a National Monument without the approval of Congress. A Wilderness Area is specially preserved within or outside of a park. There are very few amenities at the park except for a visitor center at the northern entrance to the park, and restrooms located throughout the park at numerous scenic overlooks. In addition, there are no designated campgrounds in the park, although visitors are allowed to backpack into the wilderness areas for overnight use. Permits are required and they are available for free from the visitor center. The park is serious about protecting the petrified wood. In fact, they ask you as you enter whether you have any in your car, and then again when you exit. They have an “inspection station” but they didn’t even ask to look at our vehicle as we were leaving. Not to mention, they’d need some actual probable cause to have any legal ability to search your vehicle. Know your rights! Either way, don’t take any of the petrified wood from inside the park. You can buy plenty of it at the gift shops, or in the numerous shops just outside of the park. Seriously, there are several huge stores south of the park that have big pieces of petrified wood that you can purchase after you exit the park. I’ll describe the viewpoints and scenic overlooks you can stop at, beginning from the northern side of the park. While you are here you can enjoy a free exhibit, watch an orientation film, and tour a fairly large bookstore. They have gifts, petrified wood you can purchase, and a cafeteria. There is a gas station here as well. This is a very short (1-mile round trip) trail along the rim of the Painted Desert to Kachina Point, it also serves as your first glimpse at the Painted Desert, and is suitable for simply stopping your car and taking photos. At this roadside stop you can take in some spectacular views of the Painted Desert including a tour of the Painted Desert Inn National Historic Landmark. This building was built in 1924 by entrepreneur Herbert Lore, and renovated by the Civilian Conservation Corps (1937-1941), the inn was designated a National Historic Landmark in 1987 and is now a museum and bookstore. Perhaps one of the best! Here you can see a 360 degree view of the Painted Desert. Visibility reaching 120 miles. After this stop, you’ll cross a bridge over Interstate 40 and proceed into the rest of the park. There are many petroglyphs in the rock here, and a partially excavated village. People lived here from the mid-1100s to the mid-1300s. This is perhaps the most impressive specimen I’ve ever seen of petroglyphs. There are literally hundreds of petroglyphs here that you can see from the viewing area. They’re a fair distance away, on some rocks below the ledge, but there are binoculars mounted that make viewing easy. This area reminded me of the badlands of South Dakota. The area is named The Tepees because of large dirt mounds that formed in the shape of a tepee. The colorful bands on the tepees are produced by iron, manganese, and other minerals. It’s a very interesting area to drive through, and is protected wilderness. Here, you can take a self-guided one-mile loop trail through some badlands and petrified wood deposits. Pictured above, the Agate Bridge is amazing! Don’t miss this awesome stop! 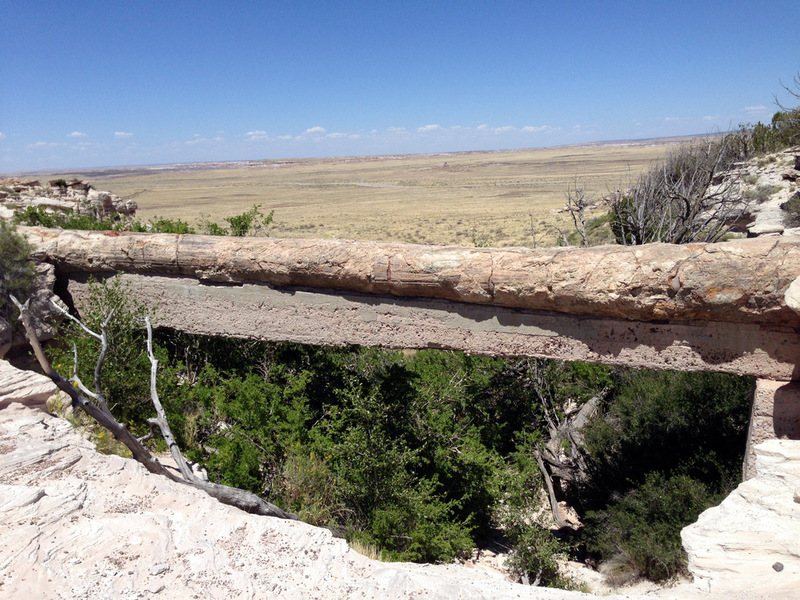 There’s a very long petrified tree trunk that is suspended as a natural bridge. It has been reinforced since the early 20th century. Another view that you shouldn’t miss! Here you can see a very large field of petrified wood strewn across the landscape. An easy 3/4-mile loop trail through a large concentration of petrified wood. The highest concentration of fossil trees you’ll see in the park, includes a 1.5-mile loop trail. here you can see a partially reconstructed 900-year-old dwelling made of petrified wood pieces. It is a 1.25-mile trail (one way) to see it. Here you can see a paleontology exhibit, watch an orientation film, and see a book store. This is also the first stop if you are going through the park northbound. This area was apparently a swampland filled with forests and streams. The trees feel and were buried beneath silica – rich volcanic ash. Cut off from oxygen, the trees’ woody tissues were slowly replaced by dissolved silica, and preserved as a “petrified forest” – trees turned to stone. The park is located in the northeastern part of the state on I-40 as you approach the New Mexico border. It’s easy to spot thanks to numerous signs and billboards in the area. The Petrified Forest National Park extends north and south in between I-40 and Highway 180, and if you are in the area you can usually use the park as a detour on your extended route. Thank you for your awesome summary!